There’s an argument to be made that The Walking Dead is essentially one long RPG; characters representing basic archetypes and forming parties to search for items across a wide landscape, encountering random battle after random battle. It’s probably even carved in stone in the writers’ room that any episode can be made of two or three characters out on a supply run, where “something unusual happens!” At this point in the game, our current quest is to find enough guns for Jadis, so that Rick can unlock his “Army” attack, and head into the final boss battle with Negan. It’s an oversimplification that can surely fit a number of shows, but regrettably where my mind drifts midway through the season, watching these characters scavenge empty structures for the umpteenth time. What keeps “Say Yes” at least a bit more interesting, is that the emphasis on Rick and Michonne allows AMC to explore territory the comics never have; treating the run as an extended honeymoon of sorts. There’s no shortage of smiling; whether Rick and Michonne christening near of every secure space they come across, Michonne sniping cans at a carnival shooting gallery, or the laughter shared as the two crash through a roof, and miraculously land on a bed in the middle of an untouched cornucopia. Perhaps one of the more repeated points heading into Season 7B was that Rick would actually smile for a change, amid an overall increase in levity, and I’d bet that “Say Yes” was the episode cast and crew had in mind expressing that. There’s very little actual tension, and even some light suggestion that if Michonne wanted, Rick would be happy to extend their vacation indefinitely, leaving it all behind. The hour never quite addresses that possibility head-on, but instead ponders the reality of life after Negan; who might lead the new inter-community order, and whether Rick or Michonne could survive without* the other. It’s not a question The Walking Dead is likely to answer anytime soon, but a decent avenue through which to fill out their headspace as we breach the final four episodes of the season. *The Walking Dead isn’t going to kill off Rick or Michonne anytime soon, though if we’re to take the pair’s conversation as foreshadowing of some sort of separation, the comics do have an extended period where Rick and Michonne get some distance from one another. They were never romantic in print, but we’re talking a Season 8 development at the earliest, anyway. 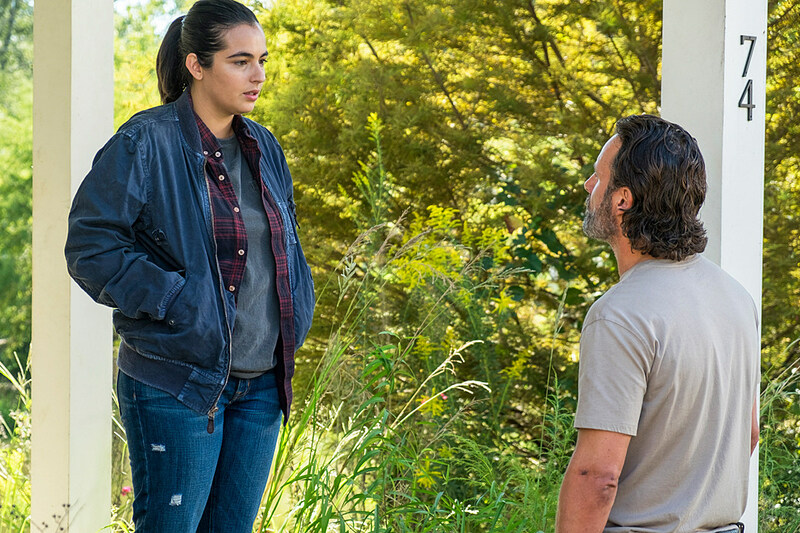 On the other side of “Say Yes,” having Rosita seethe her way through the hour wasn’t nearly as effective; presenting only the limited scope of emotion we’ve seen from Rosita in recent weeks, atop an already-thin characterization. If anything, Gabriel felt better-serviced with his brief admission that he meddled in Rosita’s mindset to keep her alive for the group’s sake, though I’m at least intrigued to see Rosita pairing with Sasha for an assassination attempt on Negan that both see as a one-way ticket. In all of this, the only shoe still to drop was Tara finally playing the Oceanside card, and I appreciate her “conversation” with Judith spelling out that both sides would likely suffer losses before any kind of partnership occurred, hence the indecision. It was kind of funny that despite Rick and Michonne’s miraculous success in finding a cache of guns to offer Jadis, the junkyard leader still demanded double that, tightening the screws on Tara even further. And, may I say, I sincerely hope Jadis sticks around for the foreseeable future. Her interactions and bargaining with Rick are too bizarre not to enjoy. We’ve probably another two episodes or so before any real conflict gets underway, but as RPG fetch quests go, there are worse pairings than Rick and Michonne to follow. Now, we can all look forward to a full episode of Rick side-questing for a deer, and presumably collecting gold Skulltula tokens along the way. So … did Rick and Michonne kill, or just rob those two golfing survivors? When the automatic weapon fired, I presumed it was them seeking revenge, before we saw the soldier zombie’s rifle caught on the metalwork. So this was a … military … carnival? Is that a thing? Damn it, do I like Gabriel now? I had a good laugh at Rick’s repeated attempts to pull the windshield walker away in one piece, and can’t recall very many other sight gags from this show. Between the junkyard green-screen two weeks ago, and the carnival deer’s jerky head movements, there are some serious CG shortages happening behind the scenes. The Walking Dead Season 7 will return Sunday, March 12 with “Bury Me Here,” airing at 9:00 P.M. on AMC.